Achieving the perfect shot is sometimes quite tricky to pull off, especially if it's an event or a situation that lasts a few seconds and takes place suddenly. The seconds it takes to unlock an iPhone and access the camera can be all it takes to miss the perfect opportunity. Apple has added the ability to access the camera app from the lock screen directly, saving users from having to waste time unlocking beforehand, but even the brief period for this process could take too long, or simply flummox some users. A patent application published by the U.S. Patent and Trademark Office on Thursday describes an "Apparatus and method for automatically activating a camera application based on detecting an intent to capture a photograph or a video." In short, it is about raising a device like an iPhone into a position where it would normally take a photograph, and based on a number of cues, the camera app can automatically appear onscreen ready for use. In its basic form, Apple suggests the mobile device can be lifted up into a stationary portrait or landscape position for a predetermined minimum period of time, as detected by onboard accelerometers. A second proximity-based sensor on the back is used to detect if there is a subject in frame or nearby that the user may wish to photograph. If the iPhone is in position and a subject is detected as within range, this can trigger the camera app and a live view for previewing the shot, and options to take photographs or a video. While there is a limited number of states where the camera app will fire up, any one of a number of elements could prevent it from working. For example, if the user isn't holding the iPhone properly in portrait or landscape orientations, is at an angle instead of being roughly vertical, or if there isn't a subject detected for the shot. 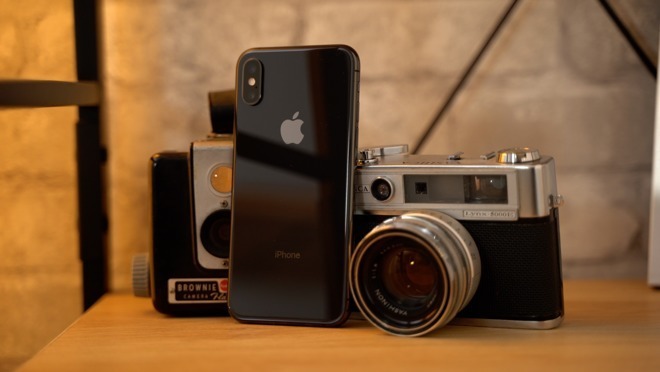 Regardless of whether or not the camera app is used, the patent application stresses that the iPhone will remain in its locked state, and will not provide access to previously taken photographs or videos, in a bid to protect a user's privacy. This is similar to the current way the camera app works when triggered from the lock screen, with the camera roll being inaccessible until the user unlocks the device. 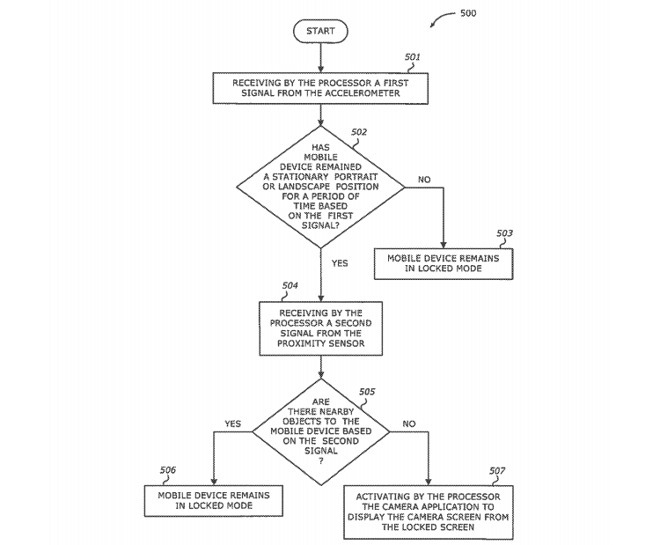 Apple registers a number of patent applications with the USPTO on a weekly basis, and while they can be taken as a guide for where Apple has worked in the past or is a current focus, it is not a guarantee that depicted functions and concepts will make their way into consumer products and services. For the above, it is plausible for Apple to include such a function as an extension to its existing locked-camera feature. While iPhones do not include a proximity sensor on the rear, it is possible that the rear camera sensors could be used to perform a similar feat, simply by turning them on and using algorithms to detect for a subject. 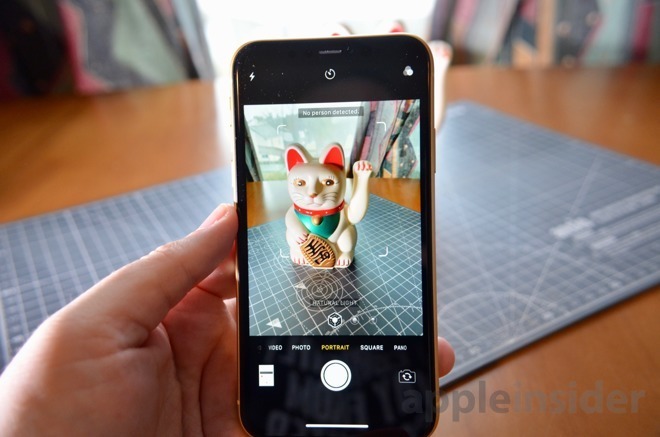 For example, the iPhone XR's single camera on the rear uses computational means to determine the presence of a human subject for the Portrait mode, and to apply the visual effects. It's possible something similar could be used for an automatically-opening camera app, albeit an option that may waste power compared to a normal proximity sensor. There have been rumors Apple will have a third lens on the back of its 2019 iPhones, with one potentially using a Time-of-Flight style system to perform depth mapping of an area, which would help with the subject acquisition element. Arguably the same subject detection could be performed for self portrait shots, as the iPhone X, iPhone XS, and iPhone XR all have front-facing TrueDepth camera arrays, making it plausible for selfie shots on current devices. Oh well, that's one thing I'll disable. How does it know that you are not intending to use something like... A torch or one of the measure/ruler apps? Not everyone is addicted to taking Selfies. Only in locked mode though. If you are using an app you won't hold your phone in picture-taking position for a period of time while the phone is locked would you? Quite frankly, I’m surprised it’s taken this long. I’m not a selfie junkie either, but when you want to snap the license plate of some idiot that just hit a pedestrian, it just might come in handy. The old MotoX Pure had a similar feature a few years back. Pull the phone out while twisting your wrist and by the time you had it raised it was ready to shoot. Took maybe 2 seconds or so. I quite liked the the quick launch myself. Today on lock screen when you swipe left Camera app comes up but than when you swipe right than it doesn't go back to whatever previous screen. Fix this first. Maybe the camera could always be running in the background in some kind of minimal state so it doesn’t drain battery, then it comes to the foreground immediately when summoned. The automatic camera activation seems pretty unnecessary since as you mention swiping left from the lock screen to get to the camera is probably more instantaneous anyway. I hope they don't take that feature away because you don't always hold your phone up for photos. I take pictures of things on my desk like documents, etc where the camera is facing down. Swiping right to return to the lock screen seems unnecessary to me as I just click the home button which I think is even less effort than swiping right. Not sure how it works on the newer phones sans home button. The #1 cause of photo misses for me since the iPhone 6 Plus was released is the damn side mounted power/wake button. The power/wake button is placed exactly where my thumb holds the phone in landscape orientation to take photos using the volume-up button. Nothing more irritating than having the screen go blank a few milliseconds before I manage to trigger the photo shutter. With the iPhone XS Max they've added the additional annoyance of initiating a screen capture while trying to take a landscape photo. I absolutely detest the power/wake button being on the side of the phone. I don't care how big the phone is - put the power/wake button back where it belongs on the top edge of the phone. It's like moving your house's front door to the side of the house because you added a porch to the front of your house. The button move was stupid with the iPhone 6 Plus and it's even more stupid with the XS max because they knew how stupid it was before they did it - but went ahead and did it anyway. Dumb. This would be great for site inspections. Always juggling project drawings notes and phone. Being able to pull phoneout of pocket take a couple of snaps with no more than pressing volume button then drop it back to pcoket write notes move on to next thing to look at would be brilliant. I can only 'like' Dewme's post once. Darn it. That's not the proper behavior. To exit an app, you swipe up from the bottom. Just because they have a shortcut to get into the Camera app from the lock screen by swiping left, doesn't mean there should be a swipe right exit gesture. I can't count the number of times I turned the volume up on my 6s instead of turning it off for the exact same reason. Having buttons directly opposite of each other is just piss-poor ergonomic design. As for the topic of the article, the number one thing I want to do when I raise my phone is use my phone, not take a picture. It's not any work to swipe left on the home screen, or press the camera button. Seems like a frivolous feature that wastes processor power (and battery) and would get annoying. And I can't imagine you would hold it up in what is typically an awkward position to then go through your apps to launch it. You bring up the flashlight app, dumb lighter at concert app, or level tool app and then hold it up. That’s because swiping right (and left) already has a meaning in the Camera app: changing the capture mode. X series phones can swipe to the camera or use a camera button in the lower right corner of the lock screen that must be force touched to activate the Camera app. Once in the app, you exit by swiping up from the bottom in the home gesture. So you're going to complain about any small change saying it doesn't fall into the "Courage, Innovate" category? Apple should only do huge changes that show courage and innovation? Yes so then they can run the narrative that Apple doesn’t pay enough attention to known issues. Remind me not to take my next iPhone into the bathroom. It could result in some scary captures. A trigger to put it in auto burst mode would be nice, but it still should have a trigger. Why not use Siri? it can open Camera.app, but IIRC it can't actually snap the photo, nor is there a shortcut to do so, something as simple as "Siri snap photo." Sigh. Maybe I should ask Alexa to do it.